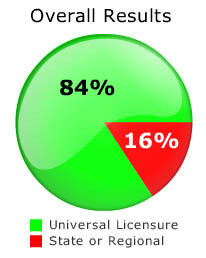 The results are clear: Four out of five dentists are in favor of universal licensure. Lots of dentists are undoubtedly hoping for a semi-working retirement where the warm breezes blow. Of course, the dentists already licensed there are not so eager to share. 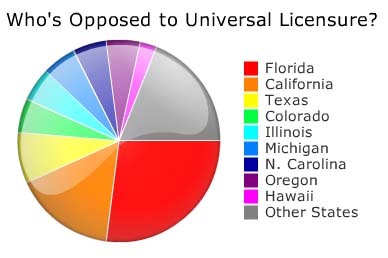 Over half of the dentists who oppose universal licensure are from the warm and sunny states of Florida, Hawaii, California and Texas. Coincidence? No way! groups – male or female, rural or suburban, general dentist or specialist – none of those distinctions appeared to affect the dentists’ votes.